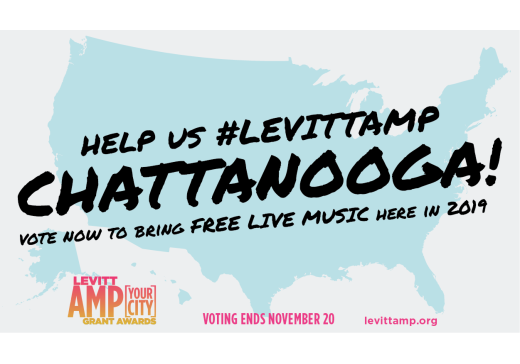 In 2017 & 2018, Chattanooga enjoyed free, live music on the lawn of the Bessie Smith Cultural Center through the Levitt AMP Music Series, and we need your help to bring it back to Chattanooga in 2019! YES, signing up to vote will take a few minutes… but it will be well worth it when you’re sitting on the lawn, in the cool fall weather, enjoying a cold beverage at a national outdoor music festival in Chattanooga! Voting ends Nov. 20 at 8pm EST. Voters must create an account in order to select their favorite Levitt AMP Music Series proposals. To sign up, you can visit the sign up to vote page by clicking here OR visit levittamp.org and click “Vote” at the top of the page, OR scroll down and click the Vote button in the “How It Works” section, to take you to the sign up to vote page. Sign up to vote for your favorite Levitt AMP proposal(s) by signing in with your Facebook or Google account, OR simply by filling out the online form and creating a password. After clicking “register” on the sign up to vote page, you will be given the option to log-in to cast your vote(s). Visit this link to log-in to your account. Once logged in, click “view proposals” to view all posted Levitt AMP proposals. Find your favorite proposal(s) and either click “vote now” to place your vote, or click “learn more” for more information about the proposal(s). You can vote for a total of 5 different proposals, but can only vote for each proposal once. Be sure to spread the word to friends, families, colleagues, and neighbors to bring a Levitt AMP Music Series to Chattanooga! HOW CAN WE GET A LEVITT AMP OUTDOOR MUSIC FESTIVAL? Chattanooga is in the running to land an annual, 10-12 week, live-music series in 2019. 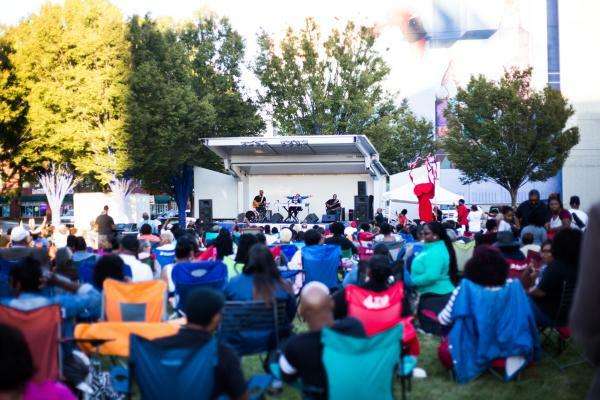 The Levitt Foundation is offering a matching grant of $25,000 to 15 cities to produce their own Levitt AMP Music Series – an outdoor, free concert series featuring a diverse lineup of professional musicians. Chattanooga hopes to qualify as 1 of the 15 cities competing for the award! The Levitt Foundation’s goals are to: amplify community pride and a city’s unique character; enrich lives through the power of free, live music; and illustrate the importance of vibrant public places. The proposed location for the Levitt AMP Music Series is the lawn at the Bessie Smith Cultural Center. The lawn at the Bessie Smith Cultural Center is located in the historic MLK district. MLK Blvd., formerly known as the “Big Nine,” was once a cultural hub in the Southeast for African American music and entertainment. This music series will reinforce the neighborhood’s unique identity as an entertainment landmark and will shine a light on its musical heritage and bright future. Summer 2018: Chattanooga (via Jazzanooga) submitted a grant proposal to receive the Levitt AMP Grant Award to produce a concert series at the lawn of the Bessie Smith Cultural Center and was approved for the initial phase. Nov. 1-20, 2018: Online Public voting process determines the Top 25 finalists for the Levitt AMP Grant Award. Dec. 2018: The Levitt Foundation will review the Top 25 proposals and select 15 cities to receive award. Jan. 2019: Announcement of 15 selected cities who will receive $25,000 each in matching funds to produce their own Levitt AMP Music Series. Fall 2019: When we are chosen for the award, the 10-12 week, free outdoor concert series will be held on the lawn of the Bessie Smith Cultural Center. See what’s coming up on Chattanooga’s weekly Music & Nightlife calendar.